A report by the Mitchell Institute at Victoria University, entitled: ‘Preparing Young People for the World of Work’, highlighted the need for young people to learn essential new skills in order to cope with the complex environments and careers of the future. Compounding this issue, research released earlier this month by global education technology provider Instructure found that schools are not doing enough to equip young people with valuable life skills that can help them thrive in the future. The research found that life skills are the most important aspect missing from the local education system, as agreed by nearly two in three students (61%) and almost three quarters (73%) of their parents. However, one Brisbane school has been breaking new ground in innovation by providing its students and staff with mixed reality technology that helps them to reimagine the ways they collaborate and learn, both inside and outside the classroom. As a Microsoft Showcase School, Ormiston College has been able to use the company’s Hololens technology to create a mixed-reality curriculum that allows students to put virtual objects into the real world. The innovative resource lets students overlay holographic digital content into their real-time environment. It also allows 3D content to look and behave like real objects, enabling abstract concepts to become visible and tangible. For example, the holographic computer can allow students to study the human body and organ systems in a tactile and visual environment. During the unit, students can step inside the human heart to see the inner workings, and view and interact with the circulatory system. Using a live stream to a computer, they can then create multimedia videos using the 3D content to promote organ donations in the community. The College has also used the device to create a virtual art gallery of Year 11 student artwork. At the inaugural Australian Education Awards on 17 August at Dockside Sydney, Ormiston College won the Canvas Award for Best use of Technology. Upon accepting the award, Tamara Sullivan, dean of innovation and learning at Ormiston College, said mixed reality technology, which is starting to make its way into education, has far-reaching benefits to teaching and learning in the classroom. “It’s expected to completely revolutionise the way we live and work, so to be at the forefront of that in a school setting is exciting for us,” Sullivan told The Educator at the event. 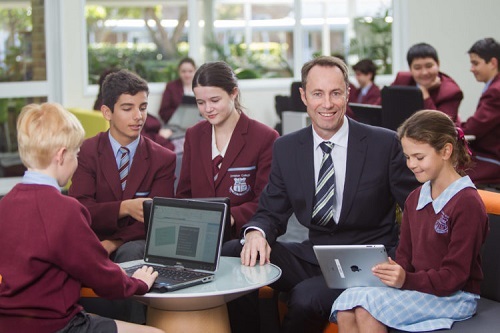 The College’s principal, Brett Webster, said what enables the College to create a learning environment where young people achieve success, is the pedagogical impact of our innovative teaching and learning framework. “At the core of our research driven programs is a focus on achieving the best educational outcomes for our students,” Webster told The Educator. Webster said the College ensures that its learners are equipped with the skillset and mindset to lead as “global citizens responsible for a sustainable world”. “It is these programs that have earned the College international recognition as a trailblazer in educational innovation,” he said.